A lot of the people who are involved in agriculture and who write blogs will probably recognize the social media hero I want to highlight this week. It’s Judi Graff aka @FARMnWIFE. There are a lot of reasons she is a social media hero to various people, but I get to make the list so we’ll focus on my reasons. Following this blog, you will learn all about grain farming and raising cattle in the mid-west. I will be writing about the good and the bad aspects of farm life. Being dependent on weather and commodity markets for a living is not for the faint of heart by any means. It is not a glamorous life but it is never boring. (Well, driving a combine back and forth for 12 hours a day for two months can get a little tedious.) I would love it if you would join me. It should prove interesting. Her husband Bill has his own blog, where he posts podcasts on Farm and Ranch Country. They have a farm website for Graff Land & Livestock. 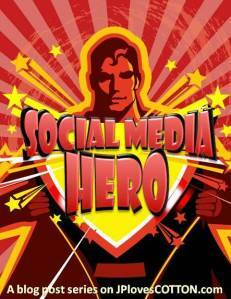 But I haven’t even mentioned the reason I thought of Judi so soon after starting this series on social media heroes…. The biggest reason by far is she is helping other people be better at social media EVERY SINGLE DAY. See, in addition to all the farming, all the telling of their farm’s story, Judi also has a blog (FARMnWIFE.com) devoted to highlighting ways to improve blogs, written in a way that is totally geared to farmers and others in the ag community! And in case that’s not enough giving back to the online farm community, she decided to up it even more for the month of January doing a special program based on the book 31 Days To Build a Better Blog by Darren Rowse of ProBlogger. She wrote a post in early December explaining how it would work and that a small group dedicated to building better ag blogs would help each other improve during January. I signed up hoping that my travel and work schedule would allow me to participate…. well people, the enthusiasm level was infectious! HOW COULD I NOT FIND TIME? I just had to do it! Now I will openly tell you that by participating in #BlogChat for a long time, a lot of the info was familiar or things I had even accomplished, but I have been doing a lot of adds and updates. Some in the group are brand-new to blogging and others are like me, have been doing it a while — all of us are enjoying the small group dynamic and the trusted feedback (both constructive coaching and the positive feedback!). I emailed you, Ms. SlowMoneyFarm. We have another group in March. Great! Jan is a great agvocate and we need these going on routinely cause so many can benefit. I feel a little guilty for taking a slot but have gotten so much that I wouldn’t give up my seat for anything! You’re going to make me cry. This is so amazingly nice of you. Everyone should write a post promoting someone else. You’ll have a friend for life. My pleasure Judi, although I don’t want any tears just smiles hopefully! This series is so much fun for me to write… I just hope others enjoy it half as much as me! Nice post. Judi certainly deserves praise! Thanks to Judi for organizing the 31 Days Better Blog group. It has been a great learning experience. It is generous of Judi to share her time and knowledge with fellow ag bloggers! Not to mention how meaningful her advocacy is to the ag industry. Great post Janice, Judi certainly is an inspiration with her tireless efforts and agvocating. Thank you for giving her some much deserved credit!